5 Reel drive will take you into the fast lane where players can enjoy an Adrenaline pumping adventure in the world of cars. All what players have to do is place their wanted bets and spin the reels so they can start enjoying the great experience and all of the great payouts that come along with it. The game has five reels and offers players 9 lines that they are invited to place their wagers on. Although some might believe that the game has a small number of lines, therefore, it is not a high paying game, the game is quite rewarding. This is because the game has generous line payouts and a great set of high paying special icons and features. Players can check all of these payouts and features out at the paytable of the game as they click on the View Payout button. 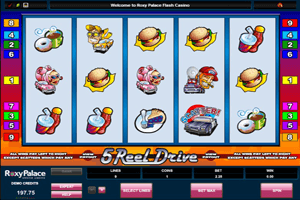 Play 5 Reel Drive Slot here. The symbols all come with a cartoonish touch to them and they include the scatter police car, a tire with a racing flag, soft drinks, coffee and donuts, a pie, a Wild Turn symbol, a pink car, a yellow car with a handsome drive, French fries, a burger sandwich and a truck among other icons. The Yellow Wild turn icon can replace any of the other icons on the reels of the game to help players get paid, except the scatter police car. The scatter police car has the ability to give out great pays whenever they appear scattered on the reels.